If you follow my blog, you should know by now that I adore the Swoon Reads imprint! 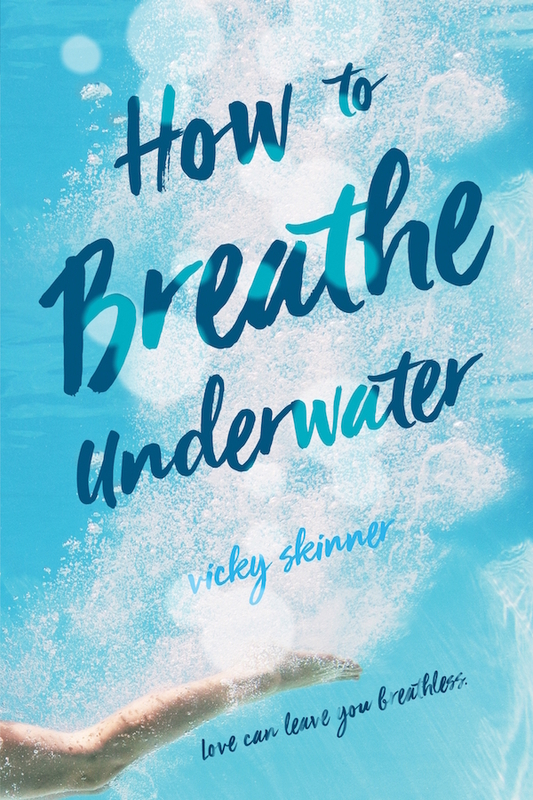 I was especially excited to read this book after author Vicky Skinner stopped by the blog to discuss swimming and reveal a surprising fact about herself. Kate’s world is falling apart. She was supposed to be training with her dad (the high school team coach) and her best friend as swim season is about to start again. However, after she catches her father cheating with on of her teammates’ mothers, she and her mother move to Portland for a fresh start and to be closer to her older sister who is about to get married. Kate is a state-record holder swimmer, but now she can’t even step foot into the pool without panicking. That is until she meets Michael, the boy next door who is able to calm her chaotic thoughts. How to Breathe Underwater tackles a lot of difficult topics (toxic relationships, divorce, cheating, etc. ), but Vicky Skinner pulls them off in such a heartfelt and engaging way. I loved being in Kate’s mind, even though she is struggling with who she is supposed to be now that the swimming chapter in her life is over. She and all of the other characters surrounding her are very layered and face their own challenges. Besides swimming, Kate is also struggling with starting over at a new school and in a new city as well as growing away from her best friend as he sticks with swimming and she obviously doesn’t. Michael’s mom is severely sick, and he’s addicted to smoking. Kate’s mom is trying to start over with a new job after staying home for all of these years. Kate’s sister runs away on her wedding day because she doesn’t know if she can get married now that her parents are divorcing. Everything felt so realistic! Kate and Michael’s romance is one long slow burn. They are definitely friends first and their relationship develops as they connect on a deeper level. They both experience insomnia and so they keep each other company during these times. They also make a deal where Michael teaches Kate how to salsa dance in exchange for swimming lessons. These lessons help Kate get back into the water as they provide the much needed distraction from her thoughts. Michael’s girlfriend is one of the girls that befriends Kate at her new high school right away, so it was a little hard to root for them when the girlfriend had been so nice. However, Vicky really makes it clear from early on that their relationship was already towards the end so it is not just Kate wrecking it. Overall, How to Breathe Underwater is a heartfelt debut filled with realistic struggles as Kate starts an unwanted new beginning. Come see my aesthetic of the book here! I’ve been super useless at commenting lately, but I have been silently lurking in all your posts about How to Breathe Underwater and I’ve been loving them! It looks like such a good book and after reading all these posts about it I definitely have to get my hands on a copy. Awesome review, it just hammered home my need for this book. I saw this at the store yesterday and wanted to pick it up so badly. But my TBR list would kill me if I added another book. I can’t wait to pick it up though! I hope you have a chance to pick it up soon! The blues in the cover are so pretty! I am a HUGE Swoon fan too, and I thought this book was pretty special. I thought Skinner did such an amazing job conveying the pain and lost feeling that both Michael and Kate were grappling with. I am absolutely looking forward to reading more of Skinner’s work. Same! I can’t wait for Skinner’s We Are the Ghosts too! AHH this sounds so amazing! I’ll definitely be picking this up. Contemporary is my favourite genre and this sounds right up my alley. Contemporary is my favorite genre too! This is definitely a great addition to it!